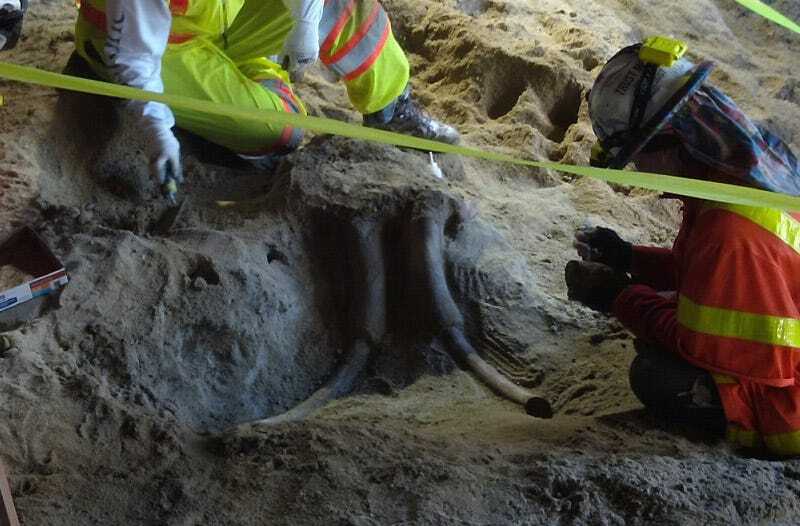 Last week, a construction project for the Los Angeles subway turned into a scientific excavation after workers uncovered fossilized skull, tooth and tusk fragments from ancient elephant relatives that have been extinct for 10,000 years. According to L.A. transit officials, remains belonging to an adult mastodon were discovered shortly before Thanksgiving, promoting officials to bring in a paleontological monitor to survey the site near the La Brea Tar Pits. On Monday, the monitor found a second set of fossils, a partial skull with tusks possibly belonging to a young mammoth or mastodon. Since such finds are not unusual in the area, officials hired an outside paleontology firm to identify and preserve any fossils found during construction before the project began. While impressive, however, the specimens are not the only scientific discovery made during a construction project near the tar pits. In 2007, a mammoth’s nearly intact skeleton was found by workers while building a parking garage. Nicknamed “Zed,” the deposit is the most complete mammoth skeleton ever found in the area.